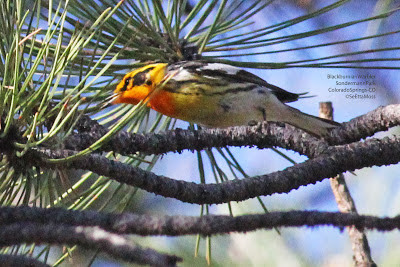 When I checked my email on my smartphone this morning I saw that a Blackburnian Warbler had been refound in Colorado Springs at the Sondermann Park there. I was on my way to that city to do some errands and shopping so I decided I would go look for it at end of the day when I finished my other tasks. I only had to drive about a mile out of my way on the drive back through Colorado Springs to get to the park. Though I wasn't sure the light would be good for viewing and photos since I didn't get there until almost 6 pm, it worked out ok and the late afternoon sunshine though it only shone on parts of the trees where the bird was foraging provided nice color when I got the bird in the light. 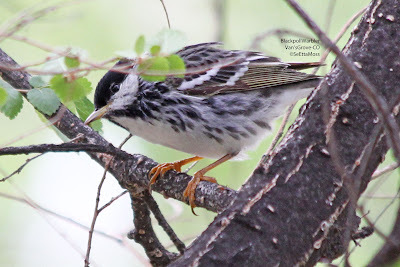 Most of the time I watched this rare warbler it foraged in the tops of a deciduous tree but it flew to a tall pine tree where I got the top pic. 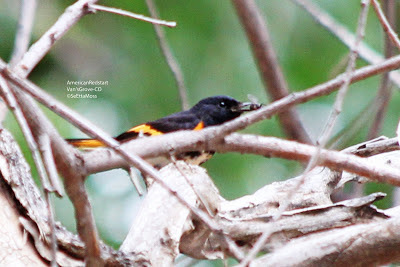 I found this male American Redstart in a Colorado hotspot called Tempel Grove located just south of Negronda Reservoir and along a major irrigation canal. Unlike much of this and other irrigation canals there is a lot of vegetation, both trees and shrubs, that the Tempels had to fight the canal company to keep (irrigation companies routinely destroy vegetation along canals to reduce water loss). Melody Temple, who is now deceased, loved birds and her husband has dedicated the birding trail area along the canal that is generously open to birders in her memory. 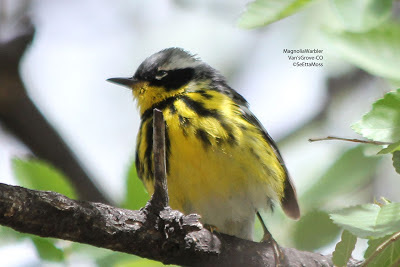 I found this male Magnolia Warbler at mid-day at a local hotspot called Van's Grove in Bent County, CO. Thanks to having to drive through Pueblo plus 4 small towns along mostly 2 lane H50 it takes over 2 1/2 hours to drive to this location (plus I had to make several stops in Pueblo) so I didn't even get there until almost 1 pm. 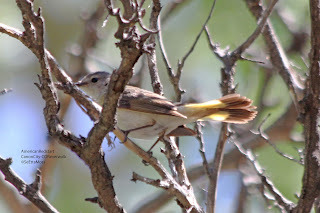 I spotted a second and different warbler but had not been able to see it for id when a local birder, Duane, drove in. 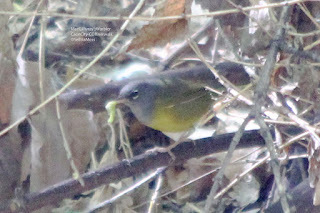 I was trying to find a photo of the other warbler but Duane told me that another birder, Eric had been there early this morning and called him to let him know he had seen a Magnolia and a Blackpoll Warbler there (I got good looks at it later and photos that I will upload after the Magnolia photos). 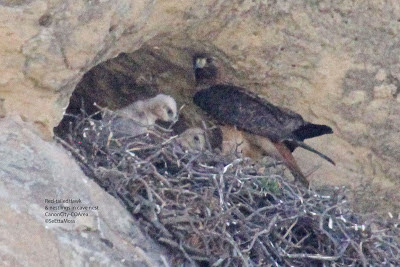 This Red-tailed Hawk has her nest in a cave about a hundred feet up a steep hill and on a cliff. 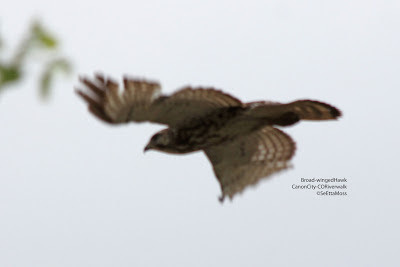 She has two young nestlings seen in these pics. As can be seen in the second pic (photo before I crop it tightly to enlarge it) the nest is very large. This nest has been used intermittently over the past 7 or 8 years and new nesting material just gets added to what is left from previous nestings. 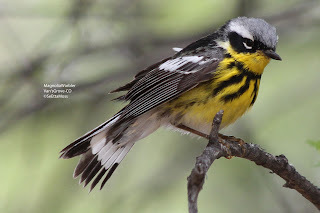 This is one of 3 MacGillivray's Warblers I found this morning on the Canon City Riverwalk (on the half mile of the bluff trail from Sell's trailhead to half mile sign). It had caught a greenish worm/caterpillar down in the leaf litter and has it in it's beak in these pics. This female American Redstart was found yesterday morning by local birder Rich. 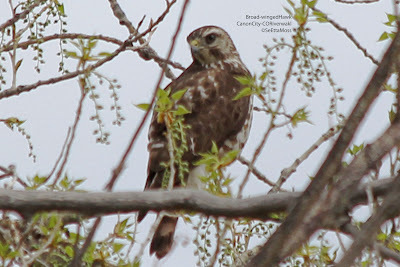 I refound it a little later but it stayed in the thick vegetation and didn't fan it's tail much. 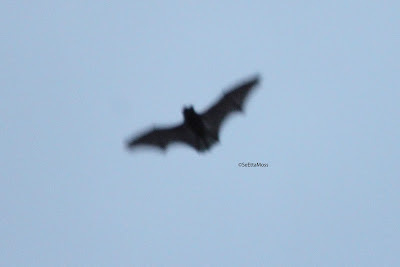 Today it came out in the open more and fanned it's tail constantly as is characteristic of this species.